It’s Fall, y’all! I know…I’m a little late, but I blame it on the amazing Florida beaches and hours spent snorkeling. Since the massive delay, I have a few fall freebies to dish out. But first, take a look at this season’s Holiday and Fall Prints, Printables and DIY Kits. Holiday Prints and Printables The shop has a ton of designs and invitations this season for Halloween, Thanksgiving, Christmas, New Year and several other significant holidays this fall and winter season. 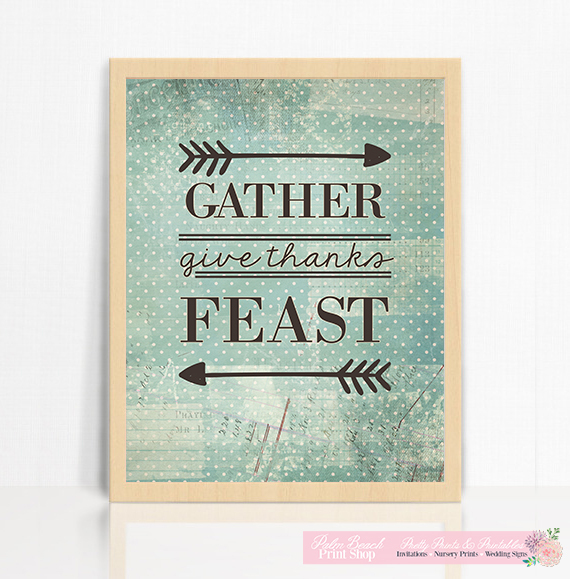 The fall print “Give Thanks” is our most popular printable. 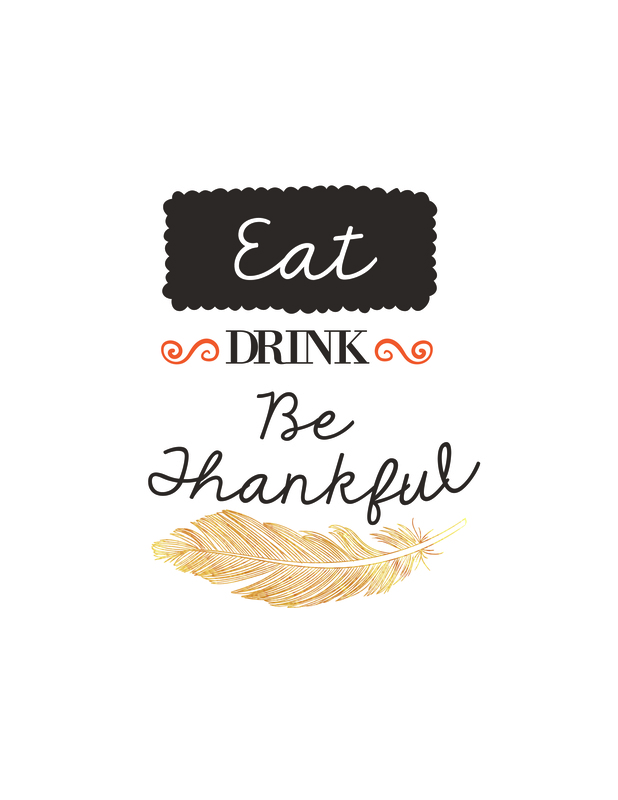 The neutral and gold metallic “Thankful” print is our most popular wall decor. 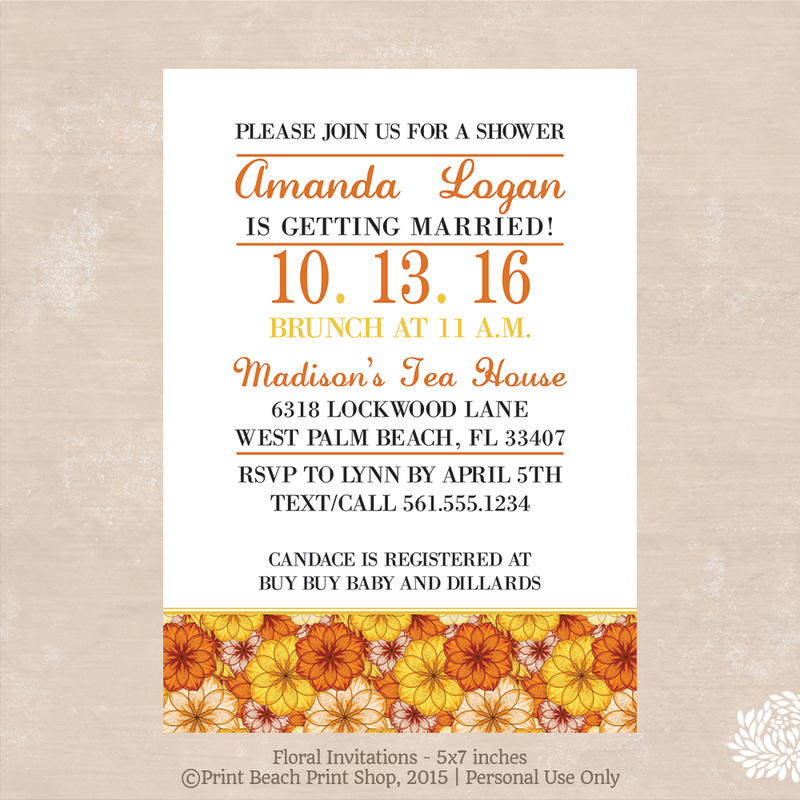 printables. My favorite this season are the prints that feature a feather. Which reminds me that I need to share a “Thankful” Thanksgiving game for the kids (and grown ups) to play! More of that on Wednesday. To browse all the new fall prints and printables, visit the shop and browse the holiday section. DIY Kits Probably the most important tidbit..The shop will now be producing and shipping DIY Invitation and Wall Decor Kits. For those a little unfamiliar, the DIY Palm Beach Party kits are currently sold at markets and other Palm Beach events the shop attends. Beginning November 1, the shop will offer DIY Palm Beach Party kits for the following themes and prints. 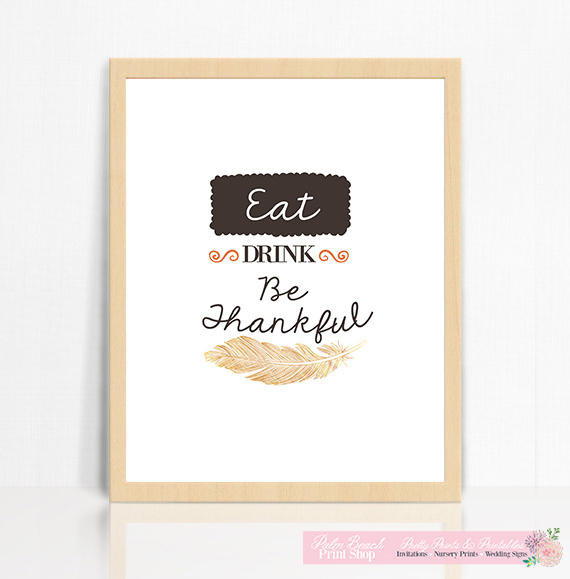 Free Printable Fall Prints Now for that free fall printable 🙂 Eat, Drink and Be Thankful is now available for free download with any purchase of a holiday item in the shop OR by simply downloading here. Most importantly, the shop will be accepting custom Chalkboard Signs, Calligraphy Signs and Wedding Signs until December 15th. Custom orders take 1-2 weeks to produce and ship. For early orders, use the coupon code HOLIDAYZ and receive free shipping. 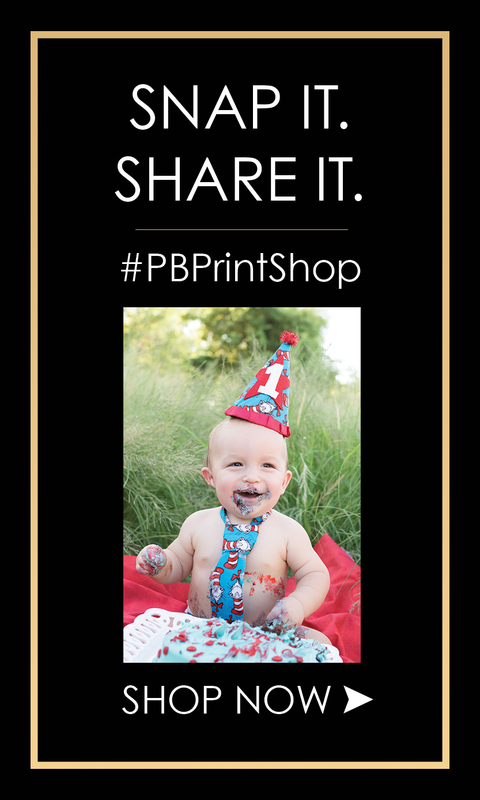 For prints and printables, visit your Palm Beach Print Shop. Bought from the shop? Share your pictures on Instagram or Pinterest. Before I hang low for a wedding weekend with my family, I wanted to share a printable meal planner that is holding me accountable this New Year. With my new work schedule, I needed a way to communicate with everyone in the house what days I intend to cook, throw together a crockpot or go to our local hangouts. The shopping list is great, because as I am in the kitchen, I can jot down items I need to buy. 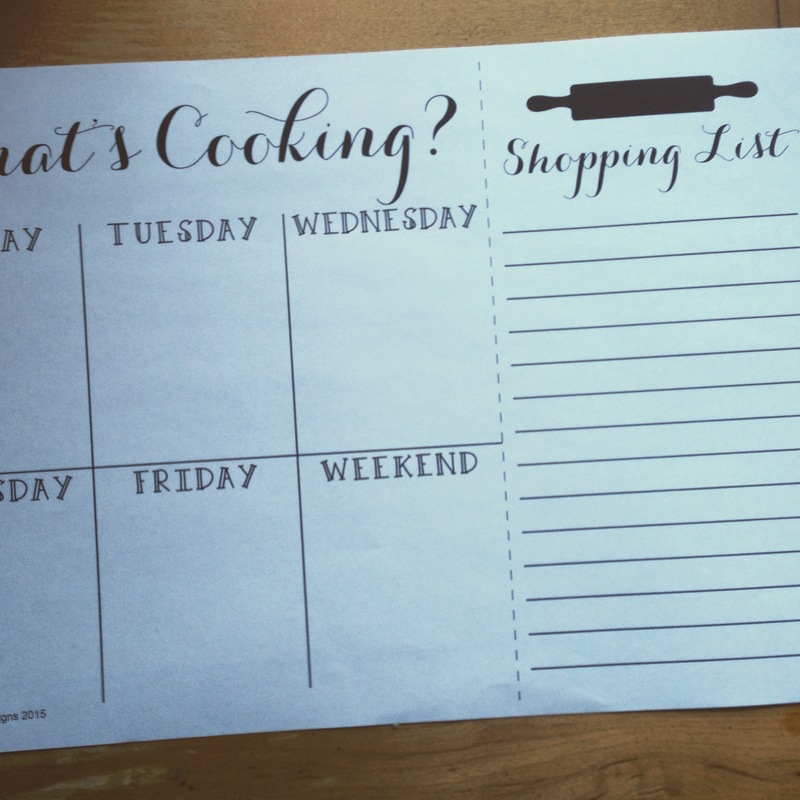 The printable meal planner is free, and has a detachable shopping list (cut along the dotted lines). I laminated our copy and use dry erase markers (save the trees). To get your hands on the free printable meal planner and shopping list, simply follow this link to download and print. For more free printables and designs by Te Amo Charlie, checkout the shop or follow your Palm Beach Print Shop on Instagram. Everyone loves a thank you note. In our home, we make a habit of sharing our appreciation for one another. We do those through acts of kindness or a good old fashioned thank you note. Often times, Chloe helps write thank you notes to Te Amo Charlie customers. We recently received a belated birthday gift from a relative. Up until this point, Chloe would typically jot down “I love you,” and “Thank you” on her thank you notes. Now that she has a bigger vocabulary, and loves to share her thoughts, I had to come up with a thank you formula for her to refer to as she began writing notes to family and friends. 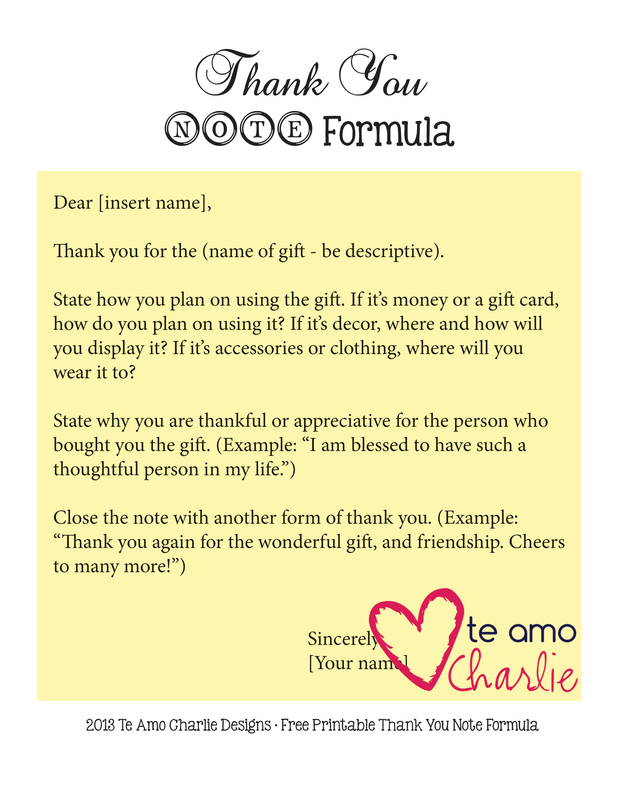 This Thank You Note Formula is the perfect way to teach children how to write thank you notes. It’s also great for writing ALL those brief, yet personal, notes to those who help make every milestone and celebration memorable. I recently handed the printable formula out for my business administration students. As a business, entrepreneur or organization, it is very important to have distribute thank you notes and reminders to your fans and clients. It is also important to have a format, or guidelines, for writing thank you notes. Having templates, or guidelines, is important for having a constant brand image. So, whether you’re writing mom and dad, or a potential client, use this simple Thank You Note Formula. To download, simple click on the photo, and save as. Happy Printing! on Facebook, Etsy and Pinterest. As long as I can remember, my dad has always had a mustache or goatee. As I began to think over what I wanted the free printable father’s day kit to be, I kept thinking of what all the men in my life have in common: they have a mustache. Yup, that’s right…my dad has a mustache, my grandpa has a mustache, my brother has a mustache, my uncles have mustaches and even my sweetums has a mustache. All the wonderful men in my family have mustaches! With all that said, if you know a dad in your life who has a mustache, than you will want what Te Amo Charlie has for you. This Father’s Day Printable Kit: The Best Dads Have Mustaches, includes a door sign, banner and a greeting card. This free printable is perfect for taking to the beach, celebrating at dad’s or having a picnic and fishing. I plan on printing the Father’s Day greeting cards for all the hairy men in my life! To get your hands on these free printables, simply follow the download link below, save and/or print. For more free printables by your Palm Beach Party Supplies Shop, visit our free printables page, follow us on Facebook and see our Father’s Day Pinterest Board or Printable Pinterest Board. One of my new year’s resolutions was to implement checklists into my daily routine. I wanted to accomplish more tasks and still have wiggle room for research, time with my family and teaching. Throughout January I began making many checklists and countdown steps for events. One countdown I made was for hosting a party at your home. Obviously every party differs and there are many factors weighing in such as food, supplies and number of guests. This party-planning checklist is simply a reminder for some of the important aspects to hosting a party. Whether you plan on throwing a casual brunch or a sit-down for 20, consult this checklist to the countdown for an amazing party. I’ve created a free printable version. The free printable includes a blank countdown, so you can fill in your own! Consider food: finger food or sit-down style? Are you cooking or catering? Figure out gift favors, games and prizes, etc. If ordering supplies online, order this week! Order or pick up wine and alcohol from the store. You will need about three bottles of wine for every four guests. Trust me on this. For alcohol, figure guests will have about two drinks per hour. Think about the lighting throughout the areas guests will be in. Try screwing in a few pink bulbs. Pink bulbs give off a rosy glow and make all skin tones look good. Follow up on any deliveries that will be made. Be polite if you are adding any last minute details to orders. Remove anything out of your medicine cabinet that you may want to hide from the snoops. Put napkins on end tables and the coffee table. This will help avoid any stains on your couch, should someone be eating or wiping their hands. There are a lot other things that take place when hosting a party at your home. Use this list to remind you of the most important things. 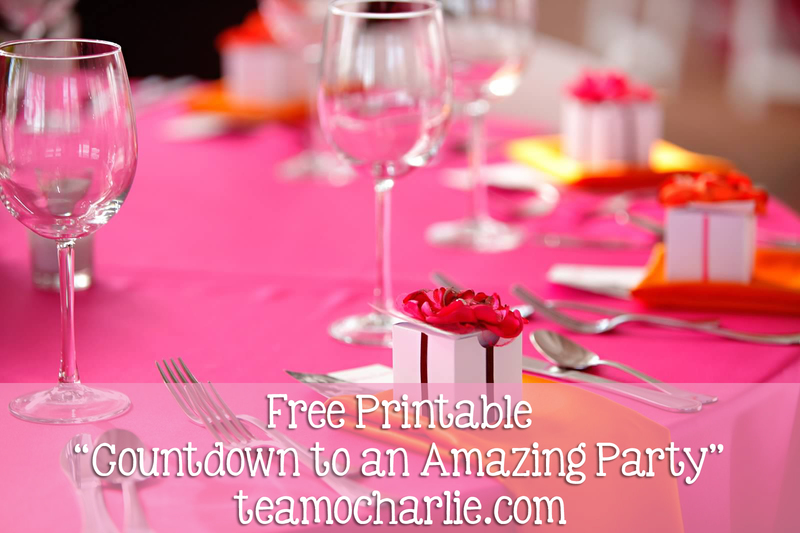 For your free copy of The Countdown to an Amazing Party checklist, and a blank checklist of your own, simply follow the link below to download. For more free printables by Te Amo Charlie Designs, visit our Free Printables Page, follow us on Facebook or visit our Printables Board on Pinterest. Monday - Saturday: 7a.m. - 5p.m.